Well, a busy frenetic post. Lots of small items got done over the past few days on my Goat Island Skiff. The daggerboard needed to get smoothed out. It was a lumpy mess. I didn't know whether to hit it with the orbital sander or my hand plane. I really just want to feed it through a real machine plane since I need to lose 2mm off the blank, but maybe I'll do that by hand... (?) However, in the end I got a roughly smoothed out daggerboard using my hand planes. It was not as tortuous as I thought it would be, and it all worked out pretty good in the end. I also needed to get my rudder glued up. Initially this had not occured along the daggerboard due to the lack of appropriate timber, I had used my supply dedicated to the blades for the daggerboard mostly. However, I did have a lump of cedar left over from the stem. I had forgotten about this one. It took a few minutes of brainstorming, a couple of swipes on the table saw, and in no time I had my blank, and it was glued up on underneath the ubiquitous heat tent in my 45 deg. F garage. A different wood pattern than the daggerboard, but that is OK by this amateur! Then it came to my attention that my transom was not backed up enough for the rudder. The intrepid reader will remember when I put the backing to the rudder gudgeons on the transom. It was a sticky mess. WELL I should have looked at Duckworks first and checked out the dimensions of the equipment I was going to use. Then, I could have fitted an appropriate backing. I did not. My backing was far too inadequate, so today I added sides to it for a 6" width, and then sandwiched on another solid layer on top. The brick weighs it all down. Finally, how in tarnation am I going to propel this boat when there is no wind? By oar! My oarlocks, sockets, and another hatch came in the mail yesterday. The oarlocks are beautiful. I got two pairs of sockets, one for the gunwales, and another pair so I could have a socket on the transom, in case I lose an oarlock or oar, I can still yuloh my way to shore and safety. Search yuloh. This also means it was time to try my hand at oar-making, which interested my lovely wife. 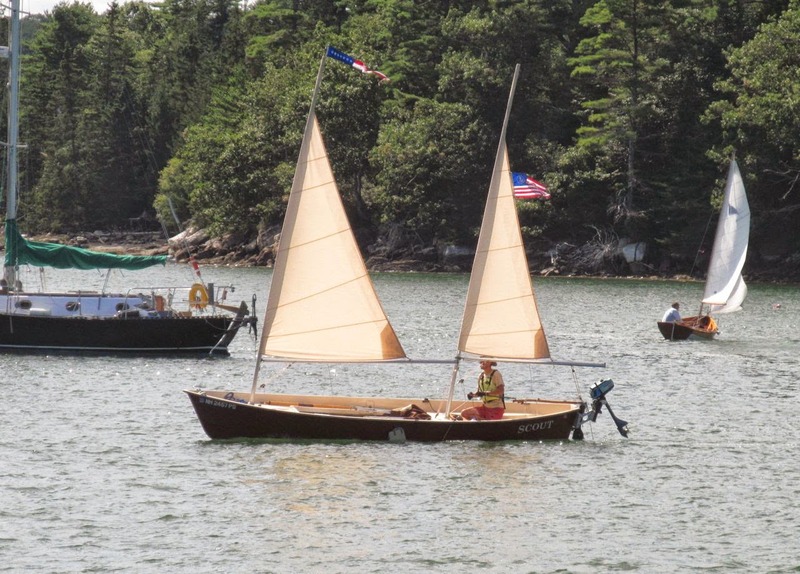 Jim Michalak offers us some oar plans in his book, Boatbuilding for Beginners, and I used those. Storer also has free oar plans available, but Michalaks were simpler, and I decided to mix and match a little bit. No problems, right? Haha. My oars for the GIS should be about 9'. Technically, 9'2", which is what we used. I bought two cheap pieces of pine lumber to make my oars, 10' long each. Each board will offer up all three layers for the laminate construction of this oar. The plans call for oars that are 6' 11" long. We extended these oars 2'3" (27") by using a formula at Shaw and Tenny oar-makers extra-ordinaire. 58" (width lock to lock) / .5 = 29 + 3 = 31" of inboard length. The grip on these plans are 5" long and the inboard portion of the loom is 16", so we added 10" to make it 26" + 5" = 31"
The remainder of the 27" was 17" and we added this to the outboard section of the loom. Then, off to map the stations, trace and cut. Then, with 4" to go on the last laminate side, a eye-knot snapped, and sent the last 6" of one of the laminates that attached to the blade soaring into the garage. BOO. I had just ripped 20 feet of board by hand, and the last 6" decided to let go. So I decided that this end was going to get the shaft (haha) and it was going to be a little short. Prototype #1, right? Then, off to the basement for the gluing!